In addition to our new Leon cookbook, I have been enjoying trialing recipes from Jamie Oliver's 15 minute meals selection. This is the first of his cookbooks I've owned, and I have been approaching the recipes with a healthy dose of realism on the time frame (i.e., I allow 30 minutes to his 15!). So far, the book is proving its worth and the 30 minute allowance is proving realistic. The first recipe I tried was Koh Samui Salad, or chilli tofu and Thai noodles. The recipe called for prawns and fish sauce, which I substituted for extra tofu and soy sauce. I also made a few other minor tweaks to the ingredient list, but did retain radishes and fennel - neither of which I have cooked with before. It turns out that I don't much like radishes on their own (bitter! ), but do enjoy them mixed with other ingredients. It also turns out that I love fennel. Seriously, how did I not know about this vegetable? My only criticism of this recipe is that it doesn't state whether the dish should be served hot or cold. The fact that it is called a salad, and the nature of the ingredients, suggested cold. The fact that rice noodles were soaked in boiling water suggested hot. As I also stir fried tofu, which was then hot, I decided to heat everything through. This was a mistake, as the dish didn't seem quite right warm, and it was only when eating the leftovers cold that I fell in love with it. Still, I know now. Mr Bite also found this a little spicy, but that could be tweaked to taste by reducing the chilli quota. The second recipe I made was falafel wraps with grilled vegetables and salsa. The only catch is that I didn't make the salsa, thinking commercial sauce would suffice instead. It didn't, and we found the falafel to be a bit lacking in flavour. They were okay when eaten in a wrap, but I couldn't get too enthusiastic about them. Things improved again with the third meal, which was "happy cow" veggie burgers. This time I made the recommended accompaniment of coleslaw with yoghurt and mustard instead of mayonnaise. I didn't like the coleslaw, consistent with my general dislike of the substance. Mr Bite also found the coleslaw to be less sweet than usual (no doubt due to the yoghurt/mustard mix instead of mayonnaise), and in future I would skip this part of the dish. We did, however, both enjoy the burger patties. The patties were also delicious cold, which was good for using up the leftovers for lunch the next day. I haven't reported the recipes for these dishes because I didn't modify them greatly, but for some free samples of Jamie Oliver's recipes you can see his website at http://www.jamieoliver.com. 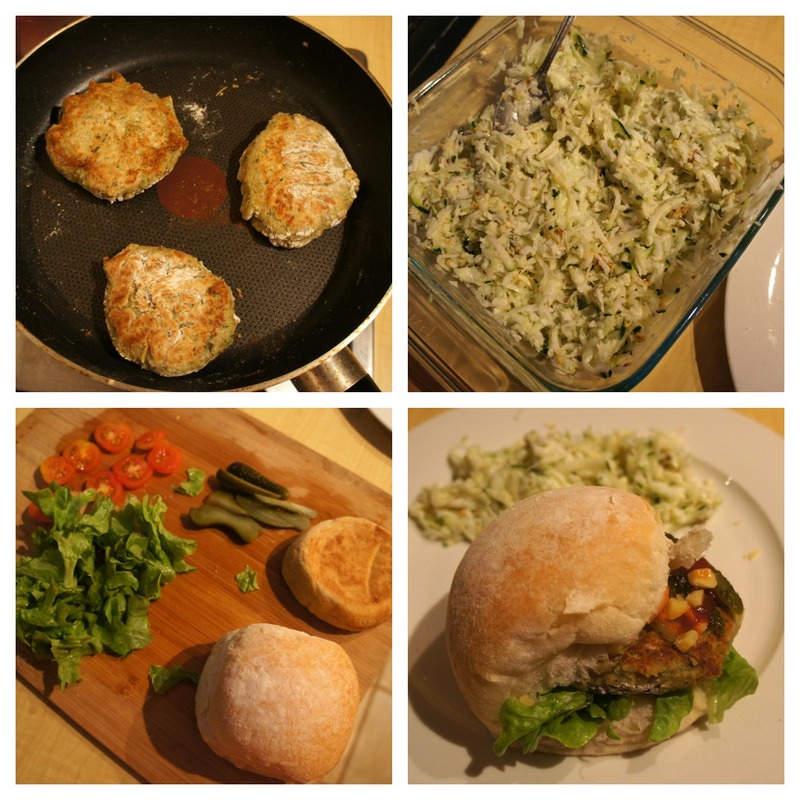 Other meals from his 15 Minute Meal cookbook have also been featured by Lisa at Bake Bike Blog. Have you made any of Jamie's 15 minute meals? Or do you have any of his other cookbooks? I LOVE Jamie's books. I think we own them all... I change the recipes quite a lot though (actually I'll be using some of them in my Vegan MoFo this year to show the transformation). I agree that they can take longer than 15 mins (or 30 with his other book) but then if I really pushed myself and multi-tasked more I might be able to do it... but I like stress free cooking. I will look forward to your Vegan MoFo posts! A radish and orange salad sounds like a lovely way to balance out the bitterness of radish. I'm going to have to experiment more with it I think. I really love Jamie...I especially love his Food Revolution when it was coming on. He is so passionate about eating healthy and I love that he thinks outside the box to get people thinking about that. These meals look amazing Kari! And very pretty! I loved his Food Revolution too :-) I think it's when I really got into his style and cooking! I am all about 15 minute recipes but I usually add some extra time especially if it is a new recipe. I love Jamie Oliver so I will have to check out the link. Peppery is exactly how I'd describe the radishes! Which is interesting, because Mr B liked them, which I wasn't expecting - but he likes pepper. I hadn't thought that through before now! What a great book! I love tasty dishes that you can throw together in no time|! I have never tried fennel, either! I don't think I'll be picking up Jamie's book, but I do want to try my own spin on that Koh Samui salad... with fennel, of course! When it cools off a bit, you should try roasting radishes in the oven. Seriously so good - the bitter bite mellows into a sweet-savoury thing, they go soft but with crispy edges. Yum. I almost want winter to come so I can make these! I've got this book, alongside a few other Jamie Oliver volumes... I mostly buy them just because I love Jamie's passion for healthy food, his dedication to the nutrition and education of the next generation of young Britons, and... well, his charitable spirit. His fifteen foundation is so inspiring. The only recipe I've tried so far is the mango quinoa salad with char-grilled chicken. It was okay; I like my own salad recipes better but I loved the idea of the blended herbs mixed into the quinoa. And yep... took me about 20-25 minutes whilst trying to work fast. I do think I could do 15 minutes if I pushed myself but... well, I love the relaxing, therapeutic element of cooking. I deliberately take my time on most days! Thanks for the interesting post! I'm so glad you liked it Laura, and I agree so much with your thoughts on Jamie's work. I'm glad to support him even if I don't like all of the recipes just because I like what he does :-) That mango quinoa salad is also on my list of dishes to try but minus the chicken! Oh no, I didn't mean to imply they weren't good! Oh dear - the salad and burgers were great, and the salad temperature issue was just a minor complaint :) I think the falafels would have been great too if I'd made the salsa as he recommended! I've got a copy of the book - you have inspired me to actually give it a go! I hope you get some good meals out of it! I'm interested to hear your opinions on this book - have htought about buying it, but I bought 30 Minute Meals and have never used it. I have a few of his others - Jamie Cooks and Jamie's Dinners are my favourite. Having one book you don't use probably is a bit off putting when considering buying another. I haven't seen the 30 Minute Meals book so can't directly compare, but I have made a few of his 30 Minute recipes from online / TV and find these ones much more manageable. I'm not a radish fan either but have never tried mixing them in with something else so maybe I'll have to give it a try. I saw that Jaime's Italian is opening in Perth this year! I love Jaime's Italian (in my pre-vegan days) but haven't had much success being able to contact them about any vegan options. It's still one of my favorite spots for a late night drink though. I had seen that Jamie's Italian is soon to reach us! Very exciting - I'm looking forward to checking it out and seeing what the menu offers when it opens. Thanks for the post. I've just started trying/blogging my Jamie 15 Minute recipes and it's good to read which ones others have made so help me decide which to try! Thanks for the article. I have just recently found the vegan lifestyle and I love it. It seems like I just can’t take in enough information. I have recently started to look for Koh Samui long term rentals. Tried the Koh Samui salad yesterday. It was delicious, but took more than 15 minutes, and the list of ingredients made for an expensive trip to the grocery store. Will try it again, but will modify the recipe to suit my taste. Maybe add some green onion and take out the radish, little things like that. Also, having both shrimp and tofu seemed like overkill. I would go with one or the other but probably not both. Dressing was a little on the sour side, but I realized later I had forgotten the sugar, LOL! Well, with so many ingredients it's easy to forget one. Also, I would dry toast the peanuts and sesame seeds rather than adding sesame oil, which basically just made everything stick to the pan. One last note, it took a long time to clean up afterwards. Jamie made it look so easy on TV, but it was kind of complicated, laborious, and took long to make and clean up. I think Jamie's skills are in a different category to most of us :-) Thanks for sharing your thoughts on the Koh Samui salad.